From and Owner's Eye: What was THAT? Home › Running Tips/Blogs › Fleet Feet Beat › From and Owner's Eye: What was THAT? It’s two days after the final day of Rochester Regional Health Flower City Challenge weekend and I’m still trying to pinpoint my opinion of all of it put together from expo setup to expo itself to SMP River Challenge Du & Paddle Tri to ……. What was THAT? There was a half marathon start, there was a 5K start and somehow after whatever “THAT” was, shockingly kids started coming out of the arena in droves to still do the Kids Run Wild races. I mean really, the weather was just ridiculously abominable. Yes, I just went to thesauras.com to find a word worse than “dreadful” and found abominable and also found despicable, horrid, detestable, atrocious and loathsome. I think those work too to describe the weather that just unleashed shortly after I yelled “GO” for the 5K. From an owner’s eye, it’s difficult to remember the whole picture when conditions as difficult as that occur during one of our largest events. I start to become hyper focused on the bad. And man, as many experienced was that weather bad. So I’m going to step away from thinking about the finish line fencing, flags and signs being blown down, the volunteers and my staff getting drenched and freezing trying to help athletes meet their goal, taking down pieces of the finish line that took over an hour to set for not single finisher or photographer to be able to see, for the timing system being engulfed by water causing our timer hours and hours of sleepless work to recreate and of course the athletes mustering everything possible to get through the extremely difficult conditions to meet the finish line. I’ll remember this. The many volunteers who dedicated hours of their time to the athletes and this event to ensure things went well for the events and the participants. The incredible sponsors, several of whom have been with this event since day one in 2010 - Rochester Regional Health, SMP, City of Rochester, Wegmans, CoreLife Eatery, Labatt Premiere Extra Light Lager, Hyatt Regency, Monroe County Sports Commission and IHeart Media. Our wonderful vendors at the expo showing the latest and greatest product, hosting happy hours, games, shakeout runs and their support to Fleet Feet Sports. A duathlon and paddle triathlon that went without a hitch. The weather was great, the river cooperated – albeit it was 12,000 baud a week prior, by kindly slowed down by half on race day so we could host the paddle. And someone won a free Kayak courtesy of Labatt. Boy was he so happy. I will also remember the countless hours my staff put in to make sure everything goes off as smoothly as it does. Week of is always crazy prepping for expo, last minute items for race day, loading upwards of 10 trucks with water stop goods, start line materials, finish line items from fencing to trusses to signs, preparing the timing systems, prepping food trucks for both days, finishing packet pickup items such as bibs, counting shirts, hand out materials. All this while still working with customers at all stores, preparing for future races, working with race directors on future events, hosting group runs and training programs. I was indeed told by a volunteer, in positivity, this weekend that he had heard Boots and I are hard to work for, but after volunteering for us – he got it. He understood our mission. Yes, Boots and I expect a lot from staff. Mostly because our standards tend to be very high and we ourselves strive to be the best we possibly can. We will never apologize for that. And when we falter, trust me, we take it very seriously. Our staff knows this about us, and when it’s deliver time like this past week and weekend, they deliver. And this past week, ending with the monsoon, they delivered 10 times over. Each year there is always a moment where I get choked up on the mic. Something touches me. My eyes fill. I have to pause to try not to crack on the mic. This year had two moments. Moment one was seeing Becky Kehoe, 71, one of our Walkfitters and Fleet Feet Sports Club team members who did a 3:11 at Winter Warrior half, approach the side of the finish line in a wheel chair. I hadn’t seen Becky since, well, she was hit by a car this winter with a fellow Walkfitter. As they were doing their regular walking workout one morning in Greece on the sidewalk doing everything right, a car came across the lane onto the other side of the road and somehow hit them both. Since then Becky has had a completely reconstructed pelvis, a long rehab stay and now just getting back to traying to stand again. 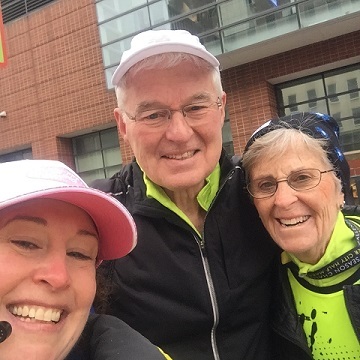 Becky approached that finish line with a smile awaiting her groom of 50 years to arrive at the finish line, for he was walking the half this year for the both of them. Becky was supposed to be at his side in the event. Mike has spent months helping Becky heal and here she was returning that gift waiting for him at the finish. At 3:03, here comes Mike barreling down the finish chute. I call out, Becky is on your right. She’s there cheering you. As Becky stands from her chair to cheer her husband in with a beaming smile. A special moment I was so glad to witness. Another moment that was special was being with Darth Vadar, a veteran who recently had his leg amputated and received a new prosthesis, at the start before anyone was around. We had privately arranged with Darth a 6:45AM early start. We made this special consideration knowing he was determined to do this and he is very self reliant; but we also knew given the circumstance, he would have been out there by himself for a very long time had he started at the regular time. At 6:45AM it’s pretty much just he and I and our sound folks. No one on the road. Nobody really walking to the arena. 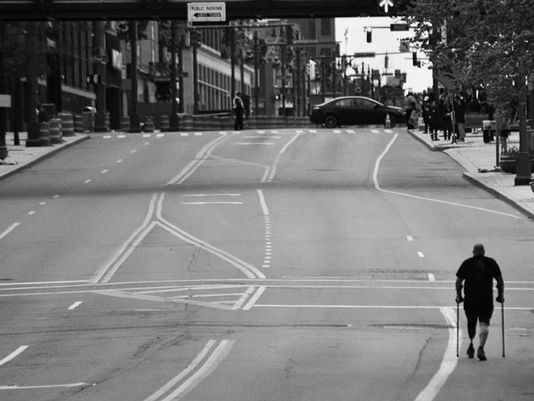 I say go…..and just watch him head down Broad Street… It was kind of powerful seeing this lone figure on crutches, working his way step by step. As the race progressed, we kept tabs on him from our crew. At first, from early reports, we really didn’t know how he was going to fair time wise. From our vantage point he definitely was struggling at first. Then around mile 6 we were getting reports where he was. Looking at our clocks, we were like, wow….he’s picking up. Then we hear he’s at mile 10. I’m thinking and saying…whoa he’s negative splitting. Our SAG had to leave him at Mile 11ish, as the race was officially over and they had to sweep the remainder of the course to open roads. We knew then that he was definitely on his way. Alas around 12pm, with just the finish line structure up, here he comes down Exchange. Our crew and one of his friends gather around the finish line. I kept one finisher medal in my pocket and pull it out. I’m recording it, Boots is recording it. People are taking pictures. We are cheering. RPD is honking their horn. And there he is……at this finish line with his crutches and new leg. Put the medal over his head. Experiencing this moment after “THAT” …. Those horrific conditions. Watching athletes coming in drenched, frozen, determined to see the end ….volunteers and staff enduring the conditions to make the experience great for participants….seeing Becky from her wheelchair cheering on Mike who is racing for the both of them…..to Darth making his way to the finish on a new leg after years of pain. Well, I guess my answer is of What was THAT?….. THAT WAS AWESOME!